On Saturday, May 24th an All-National Prayer for Ukraine was held. 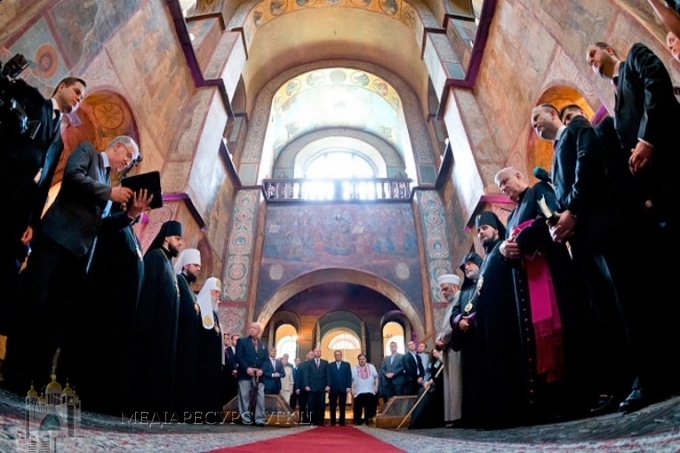 The heads and representatives of Ukrainian Churches prayed in the Sophia Cathedral of the National Preserve Sofia Kyivska, informed the Institute of Religious Freedom. Prayers were said by; UOC KP Prelate, Patriarch Filaret (Denysenko); Archbishop-Emeritus of the Ukrainian Greek-Catholic Church, Lubomyr (Husar); Bishop of the Roman Catholic Church, Stanislav Shyrokoradiuk; Senior Bishop of the Church of Christians of Evangelical Faith, Mykhailo Panochko; and other religious activist of Ukraine. The hierarchs of the Churches prayed for Ukraine, for the Ukrainian people, for protection, unity, and God’s blessing for our country, for an honest and democratic conduct of the elections of a new President of Ukraine. Participating in the event were also: Acting President of Ukraine, Head of Parliament, Oleksandr Turchynov, and Prime-Minister of Ukraine, Arseniy Yatseniuk, government officials, Ukrainian deputies, and other political and community activists. After the prayers, the choir sang “Our Father” and “Oh God, Almighty and Only.” At the conclusion of the prayer service, Oleksandr Turchynov and Arseniy Yatseniuk greeted the heads and the representatives of the Churches. A reminder: the proposal to hold an All-National Prayer for Ukraine Service was suggested by Acting President during the meeting with the All-Ukrainian Council of Churches and Religious Organizations on Thursday, May 22nd. Having accepted this proposal, the hierarchs of the Churches announced that prayers for the Ukrainian people and for honest Presidential elections will take place throughout the day in churches of all confessions.